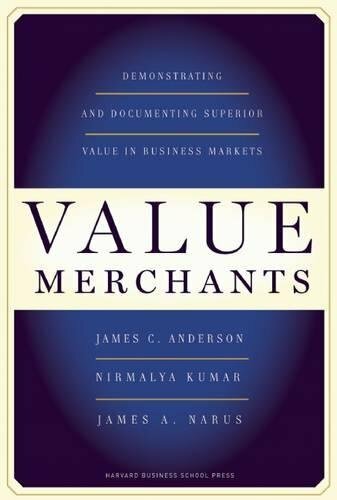 Anderson, Kumar and Narus have written a pretty good book. However, before we get into its pros and cons, two caveats: first, this book is intended for marketing and sales people in large firms who sell to other large firms. The amount of work involved with researching, calculating, and demonstrating the unique value you bring your customers may cost you thousands or tens of thousands of dollars; it may take weeks or months of non-compensated work to develop the data needed; and this is just to try to make the sale. So unless these numbers are within your marketing budget, this book. The second caveat: if your product or service does not actually provide real, unique value you can demonstrate compared to that of your competition, this book is also not for you. However, if these two points don’t scare you off, read on. . . .
Too often, businesses that sell to other businesses (B2B) find it extremely difficult to convince their customers that the products they sell deliver superior value. This usually means that they end up basing their sales pitches primarily on price and don’t really know what their customers value other than that. Value Merchants lays out a solution: Focus your all your efforts from product development to marketing to branding to your sales presentation on the unique value you bring to your customers—and not on being a low price leader. As the authors put it on page three, “Suppliers must adopt a philosophy of doing business based on demonstrated and documented superior value and implement that philosophy using an approach we call customer value management.” Think of “In a Downturn, Provoke Your Customers.1” CVM is “Provoke Your Customers” on steroids—but in a good way. The plotline is that the days of FAB (Features, Advantages, Benefits) or simple “consultative” selling are over. Customers are too sophisticated and too much in need of securing real value over the long run that they can’t settle for less. Selling has become much more strategic and much less tactical. The strategic approach requires building a close relationship with the Customer. The capital “C” refers to everyone in the target organization who impacts the buying decision, including operating and financial people. The relationships are built by working with all of these people to share knowledge and new ideas and find what works best for them. The trust that is built here is invaluable and opens up the opportunity to clearly demonstrate your superior value. However, please remember relationships do not replace facts, but they do make it easier to know how to demonstrate your value to your partner. A nice touch is the inclusion of a number of detailed case studies of companies like Sonoco, Tata Steel, and Quaker Chemical used to provide validation of the concepts. However, the authors could have added more value if they had included some service companies. It makes one wonder if these principles apply equally to service as well as product firms. The end result of this philosophy is: Use customer value management techniques to estimate the value of your market offerings, create value propositions that your customers can relate to, and make sure you convey a bottom line difference with them and both parties will maximize their superior return. Reviewed by Daniel Feiman, Managing Director of Build It Backwards, whose most recent book is THE Book on Improving Productivity by Fair Means or Foul.